In August 1875, ground-breaking ceremonies were held and construction begun on the new city hall and county buildings designed by James J. Egan in a colonnaded French Renaissance style as a dual structure for joint occupancy by city and county. With the money to go ahead, the county began construction first. After numerous delays and a lengthy construction period, the county building was completed in 1882, with completion of the city hall in 1885. The costs for both the county courthouse and city hall came to more than $4 million. 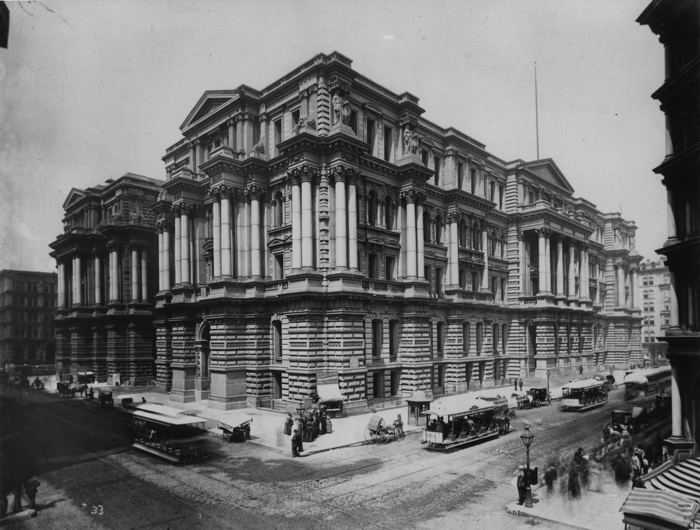 That the Department of Public Works, in connection with the building committee, lie, and they are hereby, authorized and empowered to take immediate measures to put in the foundations olf the City Hall building upon its original site, and according to such plans and specifications, and in such manner, as they, or a majority of them, may decide upon. The work was somewhat retarded in the spring and summer of 1879, on account of an investigation ordered by the City Council, growing out of certain charges preferred by the Citizens’ Committee. In April, 1881, the commissioner of public works reported “that the contract had been let for the fire-proof roofing and flooring, and that it was intended to push the work so that the new building might be occupied by the fall of 1882. But this was not realized. 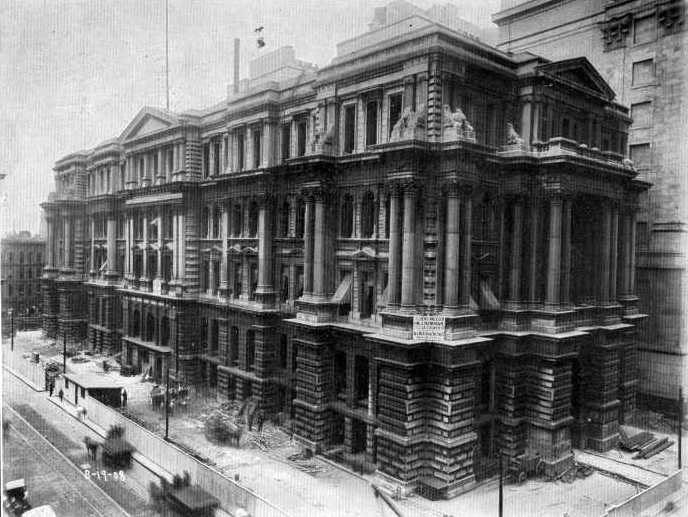 In February, 1882, the mayor reported that the building would not be completed until the spring of 1884; but it was in fact not ready for occupancy until January and February, 1885. The first officer to move in was the city comptroller, on January 3, 1885. The building is a dual structure, erected for the joint occupancy of the city and county. The style of architecture is the modern French Renaissance. Above the second story proper is a colonnaded double-story, with Corinthian columns thirty-five feet in height, of polished Maine granite, supporting an entablature, divided into architrave, frieze and cornice. The attic story is embellished with allegorical groups representing agriculture, commerce, peace and plenty, the mechanic arts and science. The building was to have been surmounted with domes. The materials used in the superstructure are principally Bedford sandstone and brick, the columns, pilasters and pillars being of Maine granite. The cost of the building, including all amounts paid therefor and due on contracts up to January 1, 1885, was $1,549,438. The amount estimated as necessary to complete the unfurnished portion is $92,600, making a total cost of $1,642,038. The county building, erected at the same time and of nearly the same materials, according to the report of the commissioners of public works, cost $2,424,668. Outside length on LaSalle Street, 366 feet; outside width on Washington and Randolph streets, 128 feet each; height from sidewalk to top of cornice, 126 feet. The interior is divided into six stories, and contains 119 office rooms, with 64 fire-proof vaults. All the partition walls are of brick and hollow-tile; the floors are of T-beams and hollow-tiles; stairs and balustrades of iron, wainscoted with colored marble in panels. The entire interior work is of white oak, of elaborate design and highly finished. The basement story, which is thirteen feet eight inches in height, is occupied by the Fire, Police and Health departments, the City Electrician and Gas Inspector. The first story, twenty-one feet eight inches high, is occupied by the Mayor, Comptroller, City Clerk, Treasurer, Collector, the departments of Building and Public Works, the Bureau of Water Rates, and the Janitor. The second story, twenty-one feet eight inches high, is occupied by the Commissioner of Public Works, and the Bureaus of Accounts, Special Assessments, Engineering, Sewers, Maps, Streets, and the janitor. The third story, twenty-three feet eight inches high, contains the city law departments and the Hoard of Education. 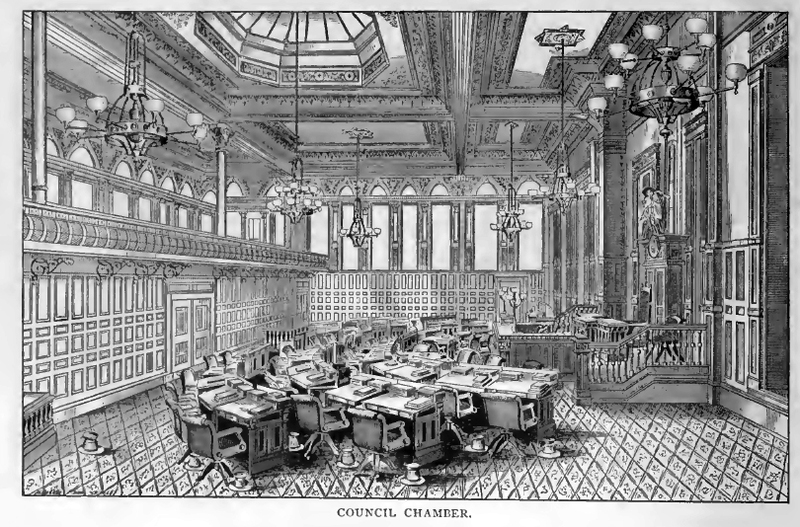 The fourth story is occupied by the City Council, the main chamber being 90 by 55 feet. The rooms in the fifth story are unfurnished. The City Hall building as it is to-day cost, exclusive of the ground upon which it stands, very nearly $1,800,000. The cost of the Court House exceeds this figure by nearly $1,000,000, but that much money additional didn’t go into the structure. A great part of it was used in bribery, in election expenses and in riotous living. If the walls could speak they would tell the story of the most corrupt period in the history of Cook cou ty politics. Some of the living ex-county commissioners, by the way, could, if they felt inclined, tell it just as well. That the city hall and county building, in direct disobedience to the ordinances, are almost wholly without fire escapes were revealed yesterday by a fire which threatened the destruction of the latter structure, caused injuries to six persons, one of whom may not recover, and a property loss of $10,000. The blaze stirred the building department to the realization of the danger in which employes and the valuable records are placed and Commissioner Williams declared last night that he again would order that both the city and county buildings be equipped with fire escapes and other precautions. He said, however, that he did not expect to achieve any practical result, as he is without legal authority to enforce his commands. Lacks Power to Enforce Ordinance. “On Nov. 2, 1903,” said Commissioner Williams, “I notified Henry G. Foreman, then president of the county board, and Commissioner of Public Works Blecki that fire escapes must be put into the city and county buildings. 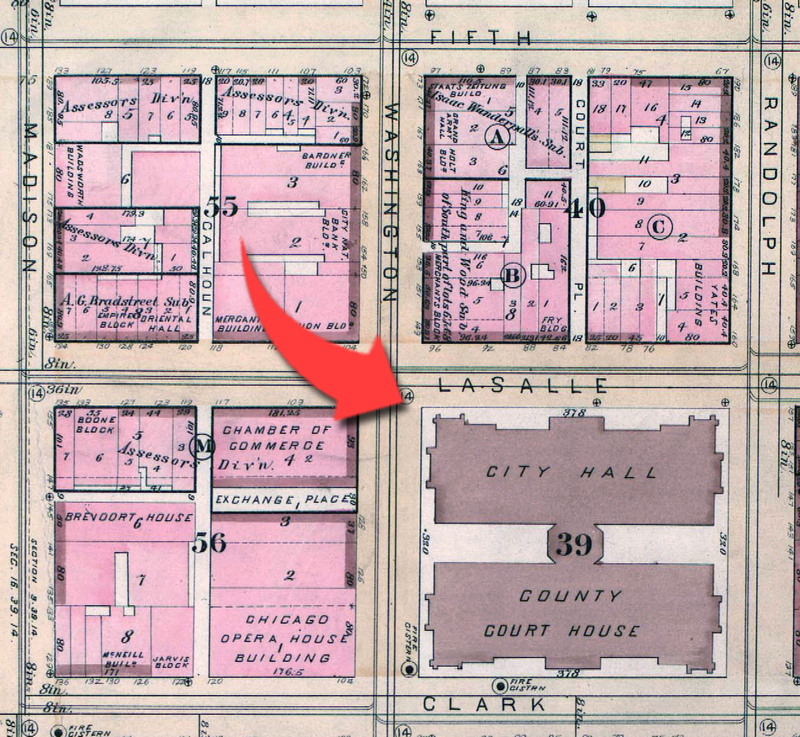 I specified two standpipes on the La Salle and Clark street sides of the block upon which the two halls are built, and two pipes in each of the courts. That’s the last I officially have heard of the matter. Superintendent of Public Services McLaren explained that no fire escapes had been put into the county building because of lack of funds, and Commissioner Blocki gave the same excuse for the city’s neglect of this precaution. The fire started at 9:30 a.m. as the result of an explosion of gas in a storeroom, also used as a paint shop, in the south end of the fourth floor. It was confined to two bailiffs’ rooms and the apartment in which it originated. Edwards, Thomas, 500 South Fairfield avenue, chief painter; probably fatally burned on face and body; taken to Samaritan hospital. Enholm, 8746 Buffalo avenue; body burned in explosion. Gilliam, Richard, fire insurance fireman; overcome by smoke; taken home. Leahy, Thomas, deputy sheriff, 8005 Commercial avenue; struck by plaster on his head and back. 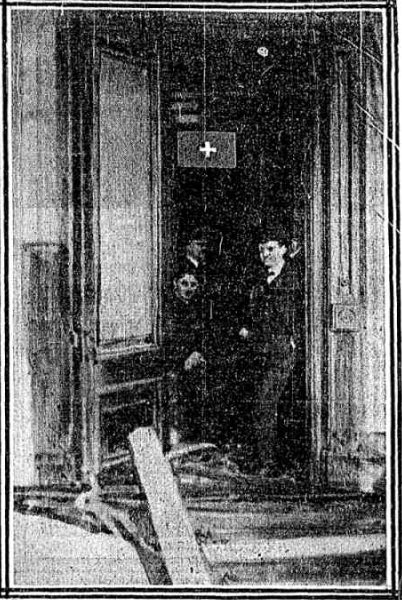 Margolia, Benjamin, 560 South Morgan street; struck by plaster on head and body bruised. McKenna, William J., bailiff in Judge Honoré’s court; overcome by smoke in carrying records from court. The fire started before the courtrooms had begun to fill up. When Chief Painter Edwards entered the storeroom he found it filled with gas, which a spark from a pipe or some other cause, exploded. He was followed by his assistant Enholm. Both men were thrown to the floor and their clothing set on fire. Benjamin Margolia, a painter, leaped through a window and crept along a narrow ledge to a window in Judge Dunne’s courtroom. He said that he and the other two men had been looking for gas leaks. 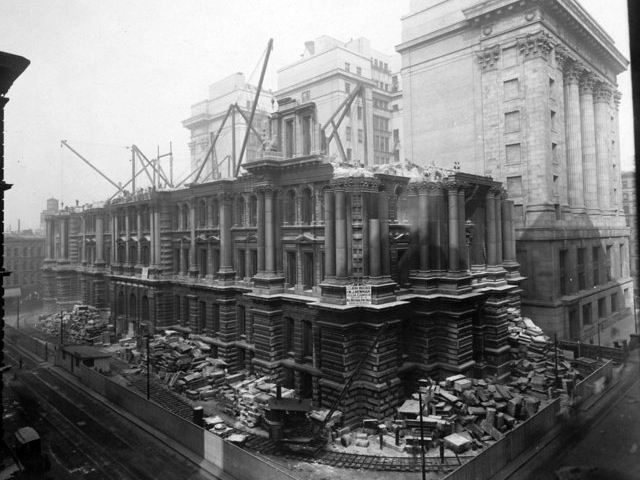 Brave work was done in saving the records when the entire structure was believed to be in peril. One hundred and twenty-five girls in the county recorder’s department remained at their posts until 3,000 deeds had been looked up. Seventeen bailiffs, trapped in a small room next to the one in which the fire originated, found their exit cut off. They discovered a permanent glass transom, through which they climbed and saved their lives. Transom through which 17 men escaped from the bailiff’s office into Judge Dunne’s Court Room. It was announced at night that the damage had been repaired, so that all the courts will be open today as usual. One week after the fire, the county board created a commission to determine whether the county should repair and remodel the existing building or build a new one. The following month, the commission reported that construction of a new courthouse was imperative and that a long delay was out of the question. Occupies (excepting council chamber) entire fourth floor of the City Hall. Was founded in 1872. The library contained at the date of the last annual report of the directors, June 1, 156,243 volumes, and the collection is increasing by purchase and donation at the rate of 7,000 to 10,000 volumes annually. Its literary treasures, many of which can not be duplicated at any cost, are at the lowest estimate valued at $250,000. With an annual circulation of over 1,250,000 volumes it maintains high rank among the free public libraries of the country. At the Paris Exposition of 1889 it received the distinguished honor of an award of a gold medal, on an exhibit consisting of the annual report, finding lists and a volume showing in detail the administration of the library in every department. A reading-room is maintained, which last year was patronized by 700,000 visitors, 550,000 periodicals being given out across the counter. There are also reference departments including general, patent and medical, which are consulted, by thousands of people in search of special knowledge, annually. A Cosmopolitan Collection.—There is not a more cosmopolitan place in the city than the library rooms. It is a place wheie the people of all nations come for their reading matter. The library is composed of books in all languages, selected with the greatest care. Naturally, the English tongue predominates, but the Bohemian or the Greek or the Italian can find the works of the leading writers of his country in its cases. As a result, the library assumes a cosmopolitan phase, because it is so extensively patronized by the people of so many different nationalities. The method of securing new books is simple. The librarian really does the selecting. The list prepared by him is placed in the hands of a proper committee, who either indorse or modifythe librarian’s choice, and the amended list is finally voted upon by the board. That the majority of the reading public who look to the library rely greatly upon it. is proven by the many applications made daily for the new books they have heard about or read about in the newspapers. The fact also proves that this city is the home of intelligent, wide-awake people, who wish to keep abreast of contemporaneous thought and literature. Administration and Cost of Maintenance—Frederick H. Hild, the librarian, has four assistants, namely, W. B. Wickersham, secretary; E. F. L. Gauss, Elizabeth A. Young and Kate M. Henneberry. There are forty attendants regularly employed in the day service of the library, and twelve in the evening service. With five janitors, one night watchman, one electrician, and one expressman, the total number of persons in the employ of the Library is seventy-one. The amount expended for salaries last year was $45;919.61, which included $2,787.00 paid for the transportation of books to and from the delivery stations. The total cost for the maintenance of the library for the year was $80,085.47. The board of directors consists of ten members. 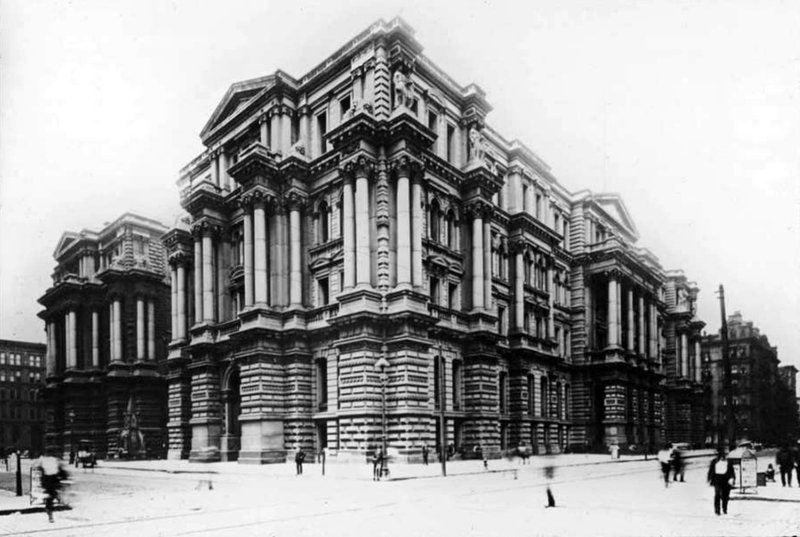 The estimated expenses of the Library for 1891 were as follows: Salaries, $50,000; books, $20,000; binding,$7,000; heating and lighting, $5,000; delivery stations, $11,000; newspapers and periodicals, $3,250; printing and stationery, $2,000; findirc: lists, $2,000: incidentals, $1,500; furniture and fixtures, $4,000; rent of reading-rooms, $2,880. arts (including patents); political and social science; language and literature; mental and moral science; ancient classics; religion; medicine; law; periodicals and newspapers; Government documents and State papers; bibliography; dictionaries and encyclopedias; English prose fiction; juvenile literature; German, French, Italian, Spanish, Portuguese, Dutch, Bohemian .Polish, Russian and Scandinavian literature. The largest number of books issued on any one day in 1890 was 5,272, on February 24th. On the same day there were used in the other departments 1,799 volumes, making a total of 7,071 volumes, which is the largest circulation reported for any one day in the history of the Library. Class of Books Most Galled For.—About 62.12 per cent, of the books taken out last year belonged to fiction and juvenile publications. Fire years ago, the per cent, was 60.12. History and biography can show 9.70 percent. ; science and the arts, 6.15 percent. ; voyages and travels, 4.63 per cent, and poetry and the drama, 3.12 per cent. New Library Building.—The block of ground on the Lake Front, formerly known as Dearborn Park, is reserved by the City of Chicago for a great Public Library Building, the construction of which can not be much longer postponed.